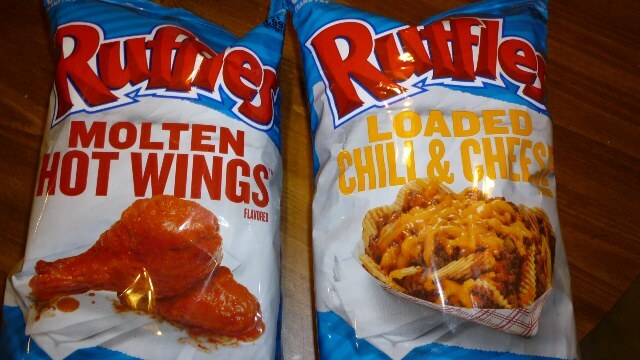 REVIEW- Ruffles has 2 new Potato Chip Flavors – I Love It Spicy! The first of the two flavors seems to be designed for the chilehead exclusively. With a name like “Molten Hot Wings”, you can only imagine that your average person might stay clear of these chips. A chilehead of course would think, “yeah right!” Is it Molten Hot or just hot enough to create a small buzz? Sean, the official cartoonist for ILIS along with myself will give you a total heat breakdown of these chips. We also give you our take on the other flavor, Loaded Chili & Cheese. My dog like Ruffles. He always aksin for em. RUFF! els. RUFF! els. I havent seen them yet. You guys must be in the test market area. I love the disco ringtone. I got the Molten Hot Ruffles this week too! And they are not molten hot at all, I was disappointed. Doritos line are much spicier. My husband and I love the Molten Hot Wings they are so good my husband is a truck driver and he gets the big bags to take with him on the road and our kids love them too…. Thankd for stopping by Heather. Try Utz’ Sweet & Spicy chips, they are great. I’m eating my first bag ever right now. The molten wing chips taste like vinegar. They have almost no heat to them at all. Real disappointment. I doubt I’ll make it through the bag before tossing them out. Welcome to ILIS Me. Most mass produced products that are targeted to the spicy community are mostly lacking heat. Every now and then someone hits a homerun, but it is rare. Thanks for coming by and sharing your thoughts.